The one technique I get the most questions about is my live sketching. A live sketch is a quick gestural study done on site in just a few minutes. 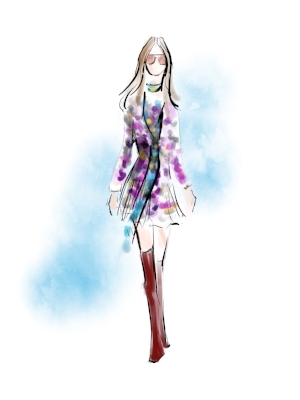 Live sketching is very trendy in the fashion world right now, it makes up a good part of my income as an artist, and opportunities for it are everywhere. 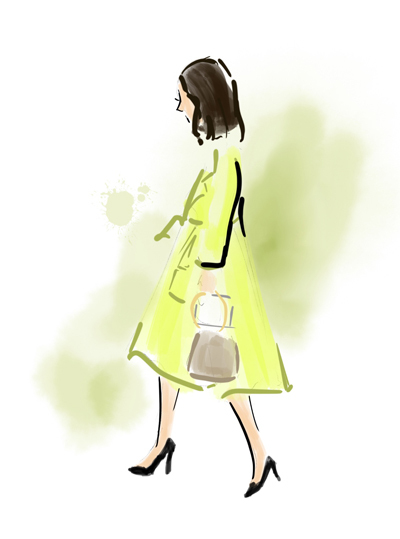 I've sketched at fashion shows, retail events, charity galas, weddings, showers, and corporate parties. It's a fantastic way to be able to work for some big industry names as well as market yourself as an artist. With that being said, the idea of sketching so quickly for an audience can be intimidating so I'd like to share with you what my process is and how I learned my technique. First and foremost, you have to understand that live sketching is a skill that takes A LOT of practice. I have done thousands of drawings over the years, and continue to practice regularly. I was first introduced to the technique of quick sketches 10 years ago when I started studying Fine Art and Concept Art at an animation school. I was taking 2-3 life drawing classes a week, and one of the exercises was 1 minute gesture drawings. 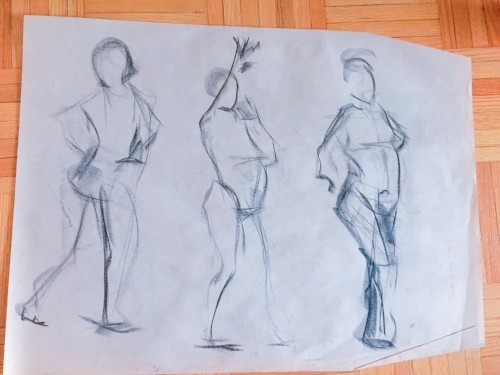 With a piece of charcoal and a large pad of newsprint, the model would pose and you would have 1 minute to sketch the pose before the model would change poses. You'd do about 25 in a row, one after the other. One class would consist of maybe doing 50 -75 of these quick sketches (along with other exercises in between) so you could imagine how quickly you were working. Examples of some of my student gesture drawings. About 95% of the sketches looked like a pile of scribbles, but every now and then you'd hit a gem, a piece that was dynamic and strong, where you expressed so much movement and weight with such little line work. 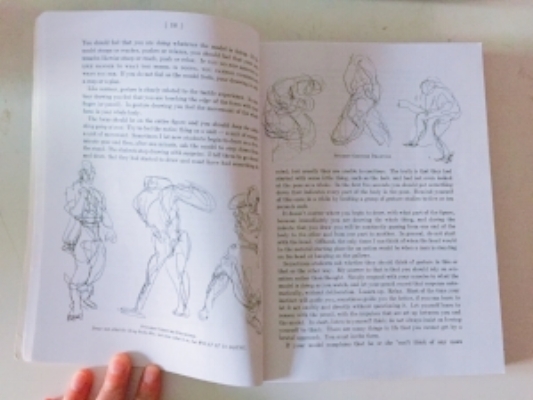 To learn about gesture drawing I recommend the book The Natural Way to Draw by Nicolaides. The second exercise in the first section is all about gesture drawing. It's quite an old book so the language is a bit dry, but the exercises are wonderful for developing yourself as an artist. 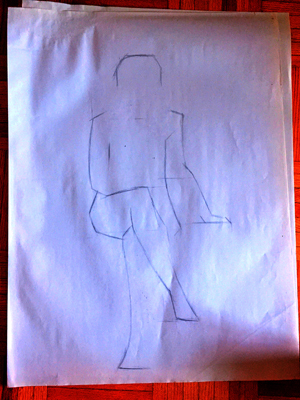 If you don't have access to life drawing classes, you can also do gesture drawing in public. I used to take my sketchbook with me to coffee shops, or on public transit and sketch the people sitting around. My first year of school I filled ten 8.5”x11” sketchbooks, front to back with multiple sketches per page, all squeezed in. Most of them were absolutely terrible, but it didn't matter. Each scribbly sketch was teaching me something, and slowly but surely I began to improve. The second exercise that influenced my live sketching was when I started at my second art school, where I was learning classical 19th century drawing and painting. The life drawing classes in this school were nearly the complete opposite to what I was doing in animation school, which in hindsight was a wonderful learning opportunity for me. Most of the drawings were sustained poses, a model would sit for you over the course of 3 months, and you would slowly build up a very realistic representation. Despite most of my work from this period being quite polished, the beginning of any drawing always started the same. You were to conceptualize your subject and simplify it into 10-12 lines. No matter how complex it seemed, you had to find a way to break it down. These drawings were referred to as constructs. 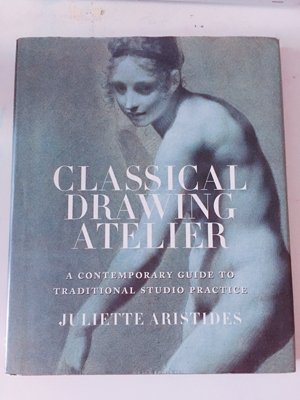 The book I recommend for exploring this exercise further is Classical Drawing Atelier by Juliette Aristides. It's an absolutely beautiful book, and is very similar to the curriculum of my school at the time. It has a great chapter on line, and the step-by-step exercises at the end show examples of the initial simplified construct drawing. So between both of those exercises, practicing them over and over again for a few years I began to develop the two essential skills needed (in my opinion) for live sketching, speed and conceptualizing. To bring together both these exercises I'll give you a step-by-step guide on how I do my sketches now, using my iPad, Apple Pencil, and the app Procreate. Since I don't have a model at the moment, I'm going to demonstrate with a photograph. Working from photographs is typical with commissioned work, and can be great for practice, but working from life is still something that should be done regularily. Photo reference is from Leo Faria , a Brazilian fashion photographer, and one my favourite streetstyle photographers! Step 1: An initial light sketch, simple and fluid. I use a combination of the construct drawings for simplifying, and the gesture drawings for the line movement. Step 2: Begin to block in colours, work quickly capturing the general shape of things. Don't worry about details. Step 3: Finish blocking in colours. A tip for working quickly is to use the biggest brush tip possible for the space, tiny brushes waste time and make a mess. Especially if you're working in watercolour, the less brush strokes you use the better if you want to avoid it looking muddy. Step 4: Add some outlines to bring dimension to the piece. I am very selective on where I outline, as too much can flatten the drawing. My choices of line placement at this point are intuitive, the only way to really get good at this is to practice over and over. Experiment a bit, keeping in mind things like how light falls on objects, drapery and general composition. If you're able to work digitally you can experiment a bit with line placement by working on a separate layers and trying a few different compositions. Step 5: Add in a few black lines for added gesture. Use these sparingly or you will lose the dynamic quality of the piece. Step 6: Optional. Time provided I add in a simple background to add some colour to the piece. Sometimes the sketch is strong enough on its own that I don't want to add a background, but it's something you can assess at the time. And there we have it! 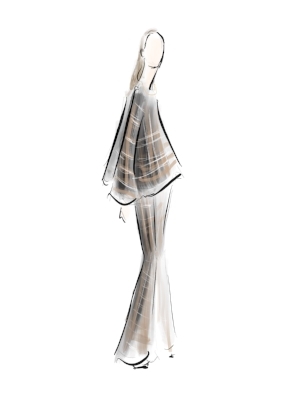 A chic, simple, gestural sketch. The time for this sketch was about 4 minutes. Professionally I've been live sketching since 2014, and my style and technique continues to evolve with more and more practice. My best advice I have for live sketching is to see it as a drawing exercise rather than a piece of art. If you are too precious with your work you will freeze up. Remember when live sketching for an audience, you are essentially giving away little pieces of your sketchbook (something I hardly ever show to anyone) so you are not going to love every piece you do. Most of them will not be perfect. In fact some of my past sketches I see make me cringe. But really, who cares? It takes a ton of confidence to sketch this fast for an audience and have everything you produce shown. Not to mention people often looking over your shoulder watching your every move. Fortunately you are your own worst critic, so those who receive a live sketch from you are usually SO thrilled with the result that your self-doubt will lessen with each one. Just keep going! Absolutely no artist produces a perfect drawing every single time, so let go of your ego, and sink into the process. Drawing is a skill you learn with practice, it's not a gift you are born with. I can say from experience that with time and practice I've become much less nervous and have really fallen in love with live sketching. As you improve, play around with different mediums. Every artist has a different preference. I've worked in pencil, pen, charcoal, conte, markers, ink and even crayons. My preferred choices now are watercolour and digital (iPad Pro and Apple Pencil using the Procreate app). Ask any questions and let me know if you have any techniques for live sketching or gesture drawing in the comments below!